A fun romp of a historical mystery, with supernatural elements. Add some excellent banter and great descriptions of the supernatural and more ordinary historical fiction settings and happenings, and this was pretty much a perfect book for me. Added bonus: I picked up the galley from the author himself, after meeting at his first Book Expo. Turns out he’s a teacher by day, and he set up a Twitter feed for his main character. He’s a delight. So, I’m really glad that I enjoyed the story as much as I did. R.F. 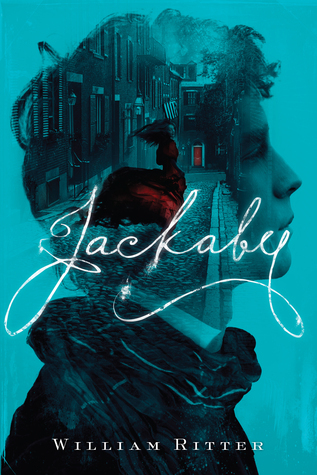 Jackaby investigates paranormal happenings in the small town of New Fiddleham, somewhere in New England. He’s hyper-intelligent, abstracted, pretty much the living embodiment of Eccentric. He’s also the only person who does what he does: maintains an extensive body of esoteric supernatural knowledge about ghoulies, ghosties and other weird creatures. He also lives in a house that has a meadow and a lake on the third floor, and a ghost that offers friendly advice. He can also see auras. What he doesn’t have: a good command of the social niceties. He’s abrupt, abstracted (you would be, too, if you could see auras, I think). And he’s The Smartest Guy in The Room. In just about any room. Reading about Jackaby, I kept picturing him as David Tennant’s Dr. Who. Or Johnny Depp’s… well, just about anything. Wild-eyed and given to esoteric pronouncements and even more esoteric attire. Once the thought occurred to me, I couldn’t shake it. I didn’t try too hard to shake it, let’s be honest. A bit Captain Jack (Sparrow, not Harkness), a bit Ichabod Crane, a bit Tenth Doctor. A bit all over the place with plenty of whimsy. Enter Abigail Rook, paleontologist’s daughter, would-be adventurer, stifled by the expectations set for her by being a woman in 19th century society. She needs a job. Jackaby needs an assistant. She’s the Watson to his Holmes, in much more of a Joan Watson grounding way, like Elementary than the sort of hero-worshiping Watson I have found in a recent reading of the original Conan Doyle Holmes and Watson adventures. She’s as likely to quash him as be awed by his abilities. I am in favor of this approach. Did I mention there was banter to go along with the mystery solving? There’s banter. Mostly to the flavor of Jackaby being weird and Rook trying to keep him focused. I like their dynamic. I like Rook’s perspective as well: she’s smart in her own right and about her own topics, as well as eager to earn her place and be a good assistant. There’s also a ghost, and a duck. And a policeman who is more than he seems. It’s a series off to a promising start, and I’ll be happy to see where it goes next.